Deana Spaulding, pictured alongside a deputy, hands out flyers to drivers during a sobriety checkpoint. Spaulding’s daughter was killed by a drunk driver with eight previous convictions. Friends of Andrea Bailes gave up their Friday night to remember their friend and raise awareness about the dangers of impaired and drunk driving. These friends are pictured taking a selfie with PPPD Chief Joe Veith and Mason County Sheriff Greg Powers whose departments worked the sobriety checkpoint alongside Andrea’s friends and family. POINT PLEASANT — A recent sobriety checkpoint under the direction of the Mason County Sheriff’s Department, with assistance from the Point Pleasant Police Department, had a personalized message about the dangers of impaired and drunk driving. 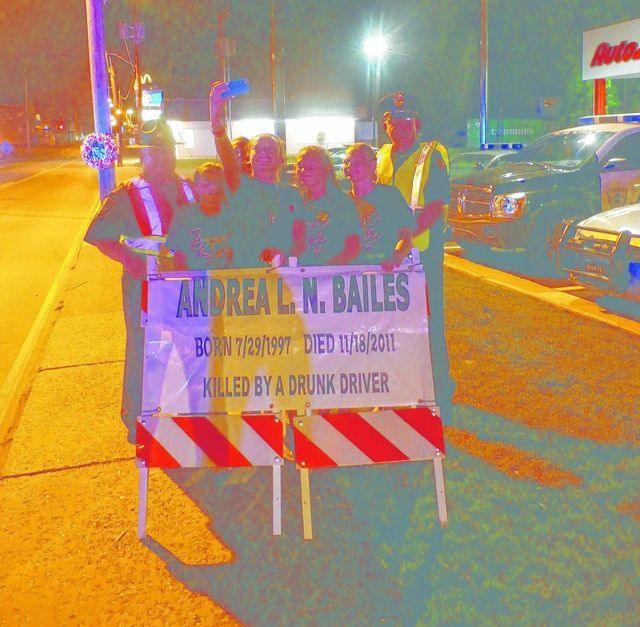 The checkpoint was held in memory of the late Andrea Bailes and noted the passing of “Andrea and Willy’s Law,” which recently was signed into law and into effect. Alongside officers during the checkpoint were Andrea’s mother, Deana Spaulding, Andrea’s family and friends, who passed out flyers on the dangers of drunk driving. This was the first time Spaulding had attended a sobriety checkpoint and for many drivers, it was no doubt the first time they’d seen the face of a mother who had a child killed by a drunk driver. The checkpoint, which was held with financial support from the Governor’s Highway Safety Program, saw approximately 1,185 cars pass through. Though no DUI arrests were made, several minor violations were noted such as expired tags, etc. There were representatives from Mothers Against Drunk Driving and Students Against Destructive Decisions also on site. In addition, a Schwan’s truck passing through the checkpoint stopped and passed out ice cream to all those gathered on the hot, muggy night.